Are you looking for some quick and easy activities for fall or Halloween? Try this cute sample pack called All About Pumpkins! 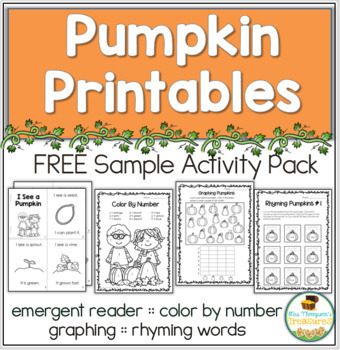 There are 4 no-prep activities included - Pumpkin Life Cycle Emergent Reader, Color By Number, Graphing Pumpkins, and Interactive Rhyming Pumpkins. Easy for you, and fun and educational for the kids!